Last major update issued on March 23, 2004 at 04:40 UTC. The geomagnetic field was quiet to unsettled on March 22. Solar wind speed ranged between 395 and 467 km/sec. Solar flux measured at 20h UTC on 2.8 GHz was 116.4. The planetary A index was 11 (STAR Ap - based on the mean of three hour interval ap indices: 11.6). Three hour interval K indices: 33322333 (planetary), 33322333 (Boulder). Region 10574 developed in the trailing and intermediate spot sections as new negative polarity flux emerged. The possibility of a minor M class flare has increased. 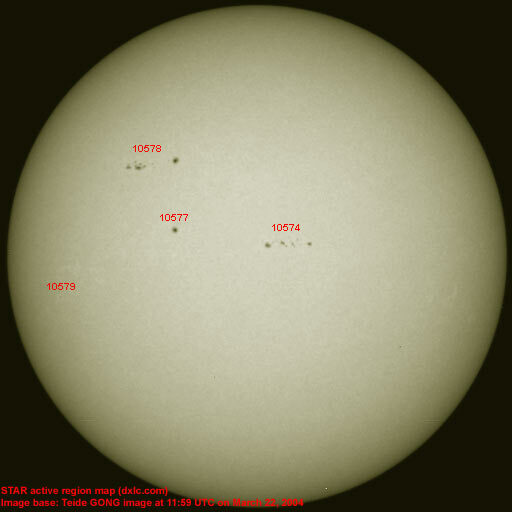 Flare: C8.6 at 06:16 UTC. Region 10578 developed in the trailing spot section and there is poor separation between the positive and negative polarity areas in the center of the region. There is a fairly good chance of a minor M class flare today or tomorrow. 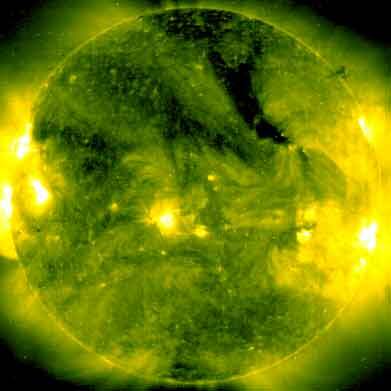 Flare: C1.3 at 02:13 UTC. New region 10579 was first observed at the southeast limb late on March 19, then became spotless on March 20. Spots reemerged slowly on March 20 and 21. March 20-22: No partly or fully earth directed CMEs observed in limited LASCO data. A recurrent, poorly defined coronal hole (CH85) in the northern hemisphere was in a geoeffective position on March 20. A recurrent coronal hole (CH87) in the northern hemisphere will likely rotate into geoeffective positions on March 25-26. The geomagnetic field is expected to be quiet to unsettled on March 23 and 25 and quiet to active on March 24 under the influence of a weak high speed stream from coronal hole CH85. A high speed stream from coronal hole CH87 could arrive on March 27 or 28 and cause unsettled to minor storm conditions. Long distance low and medium frequency (below 2 MHz) propagation along east-west paths over high and upper middle latitudes is fair approaching fair to good. Propagation along long distance north-south paths is poor. [Trans Atlantic propagation conditions are currently monitored every night on 1470 kHz. Dominant station tonight: WLAM Lewiston ME. Stations from the eastern part of North America were heard on many frequencies throughout the MW band].